Rent a 2019 Wheat Field! Rent a rolling acre of wholesome, healthful Minnesota Red Wheat. At harvest time the grain will be stone-ground into bread making flour at an historic mill in New York state. You can even order a photo of the miller with his nose to the grindstone. We’ll send a personalized, calligraphed Lease Document, your gift message, and an explanation of the program. Your recipients will receive Progress Reports about the harvest (filled with news, recipes and folklore) – building anticipation for the September delivery of the harvest. 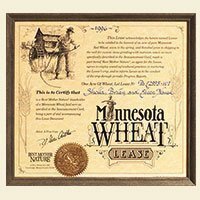 Treat a friend to a share in the bounty from a rolling acre of wholesome, healthful Minnesota Red Wheat. At harvest time the grain will be stone-ground into superior, healthy bread mix at an historic mill in New York state – all the wheat’s natural nutrients are saved & no preservatives or bleach are added. I have baked the first two loaves of bread. I’m keeping one (which is delicious!) & giving the other to the person who gave me this wonderful gift! This was a 50th birthday gift for my best friend. Her mother is suffering from Alzheimer’s disease and requires round the clock care which is provided by my friend and her 2 sisters and their father. This has been a very stressful time for my friend. When she opened this gift, she laughed and laughed and laughed. I had forgotten how long it had been since I had heard her laugh like that. I’m so glad I found your company on the internet. It gave my friend some joy in her life and let me hear her laugh again. A fun gift which I used to make some bread from an old family recipe.